it is my dream to create beautiful, wearable, personal, relevant jewelry using renewable, reused, recycled and natural materials. i started making fine silver jewelry with precious metal clay. it was addictive! you can take a texture from anything and turn it into fine silver (999) jewelry! bark, a shell, grandmas depression glass. it kept me up at night! everything i saw looked different all of a sudden. so exciting. and because the textures called out to be paired with color…. i totally fell in love with natural gemstone beads. the colors, textures, age. I love them all. i gravitate toward greens, blues, browns and grays….but ive been pushed to include reds, oranges, purples and pinks. i dont always spring for the very high quality stones. they dont always appeal to me as much. imperfections are more interesting to me. an aquamarine stone with a brown swirl and a milky-sparkly-thing going on is so much more appealing to me then a perfectly clear symetrical stone. each one is so different than the next. no two imperfect stones are the same. each is an original. just like people. it’d be so boring if we were all the same! then i fell for antique and vintage silver plated spoons. ive always loved antiques, vintage things, things with a history. things beautiful and useful. using them in different ways, something my mom taught me, has always been a passion. so my spoon bracelets were born. but then the spoons, when i found them at flea markets and junk shops, always came with forks, knives, and serving pieces too large for a bracelet. so then i started chopping them up, hammering them, bending them….and it became some of my most popular stuff! in addtion to the fine silver and flatware jewelry, i use everything from old sterling cups, sheet silver made from recycled sterling, sterling wire, copper, brass and more. old keys, gears, sea glass, rocks, anything could turn up in my constantly evolving work. i never make exactly the same thing twice. its always a little different, individual, one-of-a-kind….just like my most favorite customers! 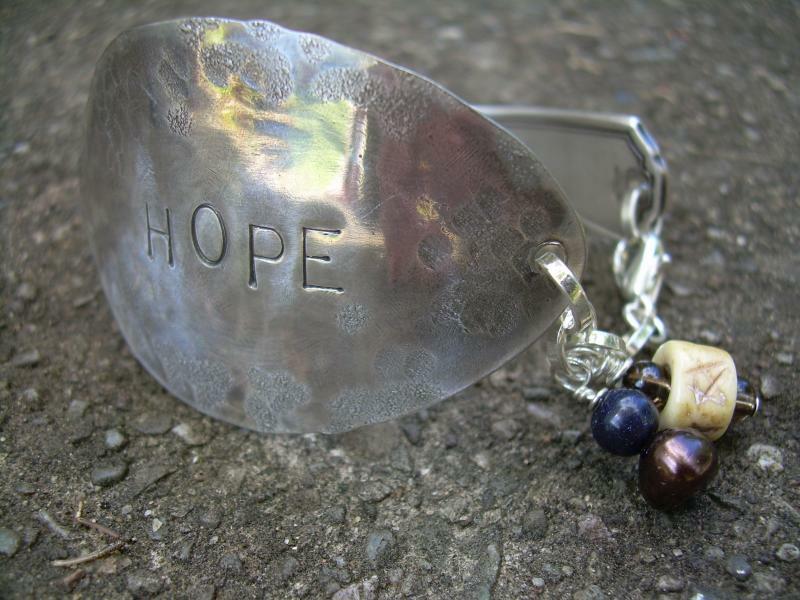 Spoon bracelets….. my signature piece. i use antique and vintage silver plated spoons to create one-of-a-kind pieces adorned with stones, pearls and charms. they are hand polished and oxidized to enhance and highlight their unique texture. these are totally customize-able! you can have a name, quote or favorite word stamped on it. you can specify your favorite stones, pearls, or charms. they can be made from different size spoons to fit different size wrists. contact me to order one for yourself or as a unique gift.